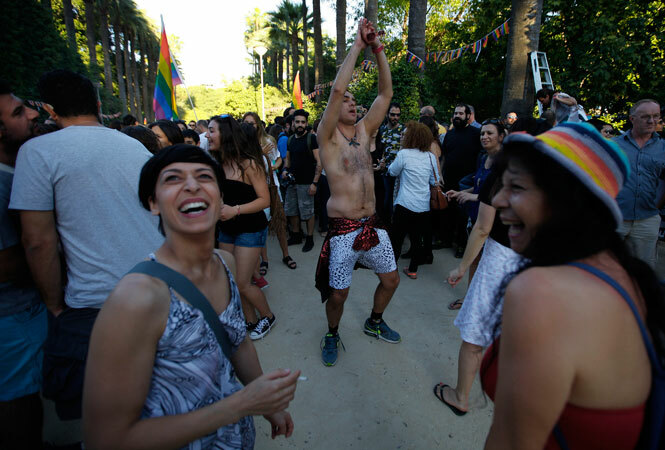 A participant dances as other people smile while taking part in the first gay pride parade in downtown Nicosia, Cyprus, Saturday, May 31, 2014. NICOSIA, Cyprus — Several thousand people turned out for Cyprus’ first gay pride parade on Saturday, exceeding the expectations of organizers who said the event’s popularity shows that Cypriots are shedding their conservative attitudes. One of the organizers, ACCEPT-LGBT Cyprus President Costas Gavrielides, said he was overwhelmed because he had expected just a few hundred people to attend the event in the heart of the capital Nicosia. “This proves that Cypriot society has progressed much more than politicians say,” Gavrielides told The Associated Press. Gavrielides urged lawmakers to pass legislation to further gay rights, including a civil partnership law. Cyprus, a European Union member and a largely Orthodox Christian society, decriminalized homosexuality a dozen years ago, but activists say the nation has much to improve on in terms of gay rights. Among the speakers addressing the crowd waving rainbow flags and carrying placa rds reading “equal rights to all” was Cypriot gay rights pioneer Alecos Modinos. Modinos’ court battles in the 1990s forced the government to repeal anti-gay laws – a vestige from the east Mediterranean island nation’s British colonial past. “We hope Cyprus becomes a European Union member country that respects rights not only in words, but in deeds as well,” said Modinos. A small group of Orthodox Christian protesters, some holding crosses, staged a demonstration nearby to denounce the event they called “shameful.” Scuffles broke out between protesters and the police as they tried to break a police cordon and approach the parade. Earlier Saturday, another Orthodox Christian group petitioned Cypriot President Nicos Anastasiades to op pose any legislation that would allow gay couples to adopt children.